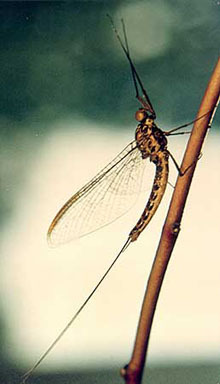 Mayfly nymphs are aquatic and have a similar body shape to the adults but lack wings. The nymphs have gills along the sides of their abdomen, which look similar to fine leaves. LEPTOPHLEBIIDAE is the dominant family of mayflies in Australia. The species are adapted to many habitats ranging from warm standing waters and coastal waterholes to the melted snow of subalpine areas. Atalophlebia species contains all the common large mayflies, most with a wingspan of up to 25 millimetres. The males of many species have 2 very long, white tipped cerci which can be up to 35 millimetres in length. Many species occur in slow flowing streams and lakes, while others can be found in billabongs of dry inland Australia or subalpine streams. The larvae of this species can be distinguished by their paired leaf-like gills along the sides of the abdomen. Mating occurs during flight and large swarms of mayflies gather close to the fresh water habitats they prefer. Eggs are laid on the water surface of lakes and streams where they sink, scattering along the substrate and amongst aquatic plants and debris. Upon hatching the nymphs live on the bottom, sheltering under stones or in the substrate. Development can take from several months up to a year and can involve from 20 to 50 moults depending on the species. Adult mayflies do not feed. The nymphs feed on aquatic plants and other associated organisms by scraping algae and detritus from underwater stones and vegetation. Some species are also known to be predators. Adult mayflies occur everywhere in Australia but are always found near freshwater environments. The larvae are aquatic and each species has preferences for a different type of habitat, which is influenced by factors such as water temperature, flow rate, chemical composition and light. The majority of Australian mayflies prefer cooler habitats with clear flowing water and are therefore more abundant in the mountain streams of the country.